Do you need a 5 minute relaxation break? If your answer is Aye aye Captain Kimo, then take a moment to check out website for this glass studio. They make beautiful handblown glass ornaments. The studio recycles 100% of all the materials used and is always searching for ways to become more green. Incredibly beautiful, this ancient artform in a 21st century, green studio, has to be on the top of everybody’s gift list. Turn on the music below, Relax & enjoy! 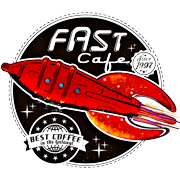 ← NewerThe Re-launch of FastCafe, in a fresh new spaceship!